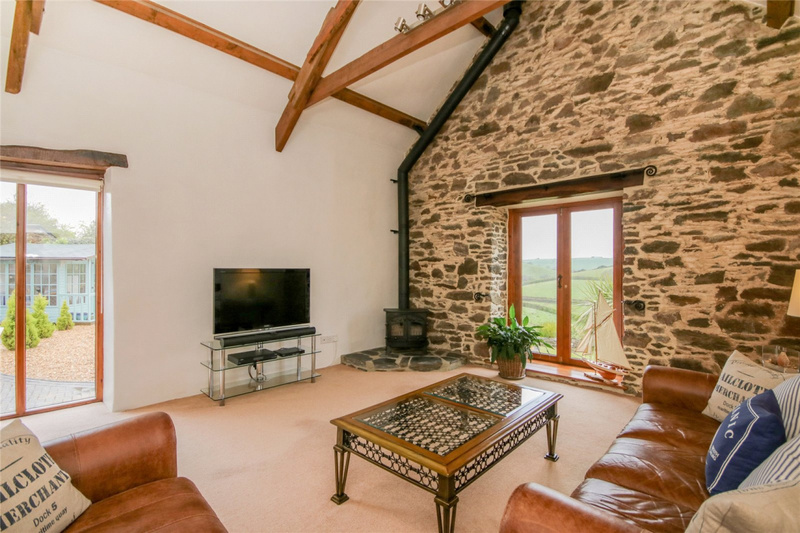 Coles Barn is an immaculately presented, detached barn conversion maintained to a very high standard and offered in exceptional order throughout. 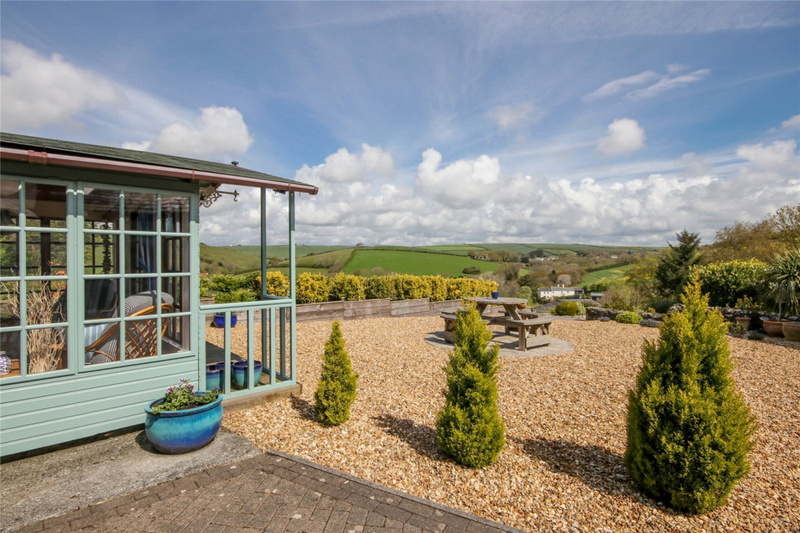 It comprises three double bedrooms with master en-suite, a feature sitting room, fully fitted kitchen, ample parking and breathtaking views over the surrounding, unspoilt countryside. This property would be equally well suited as a permanent family residence or as a holiday home. 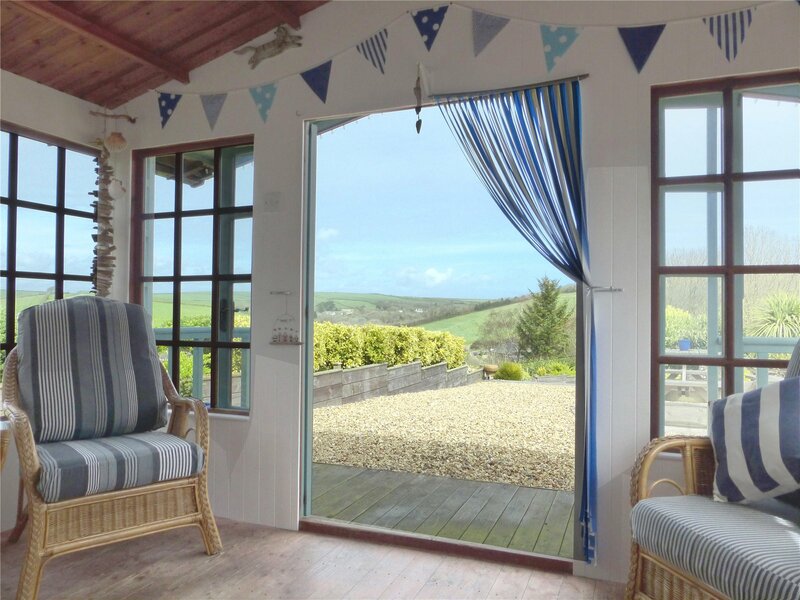 Coles Barn is ideally situated in a quiet rural location with uninterrupted views over open countryside but is conveniently located within easy reach of Kingsbridge, Dartmouth, Salcombe, Beesands, Torcross and the wonderful sandy beaches of Millbay, Lannacombe, Mattiscombe and East Portlemouth. Ford is an attractive hamlet that sits in the beautiful rural countryside of South Hams The nearest village being the picturesque village of South Pool which is located at the head of one of the creeks off the Salcombe estuary. 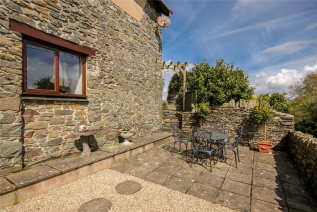 It hosts a 14th century church as well as the award-winning Millbrook Inn and is less than two miles away by car or just over a mile walk along a quiet country lane. Just 2 miles from Coles Barn the village of Frogmore hosts a village shop and the Globe Inn, whilst the nearby village of Chillington has a shop, post office, health centre and school. 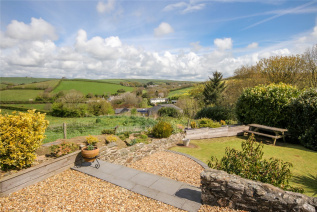 The market town of Kingsbridge is only 4.5 miles away and offers an excellent range of shops, services and amenities, including two supermarkets and a community college. 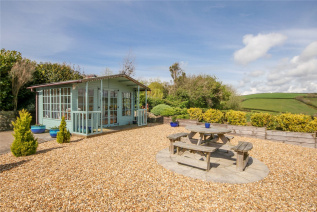 The property is equidistant from the thriving estuary locations of Salcombe and Dartmouth, both renowned for their nautical settings. 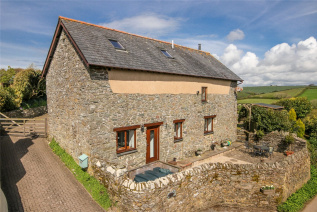 Coles Barn sits in a location that is perfect for outdoor enthusiasts who enjoy country or coastal path walking, where there are numerous beautiful routes to choose from. 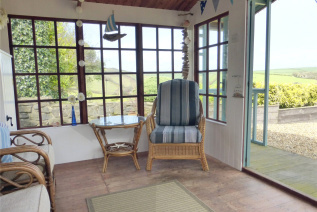 There is a choice of two entrance doors. A part glazed oak stable door gives direct access to the kitchen area whilst the second door provides access via the hallway. 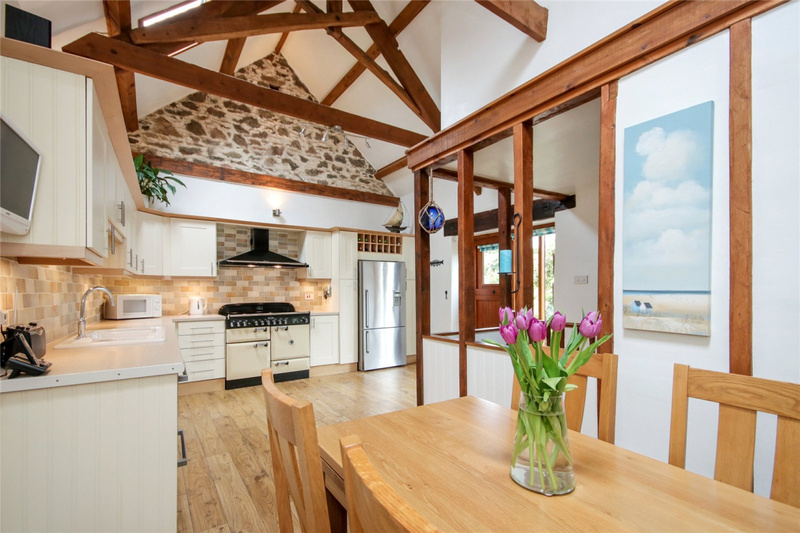 There are exposed ceiling beams and timber stud work to one wall. There is access to the cloakroom whilst stairs with an attractive open balustrade lead to the lower ground floor. 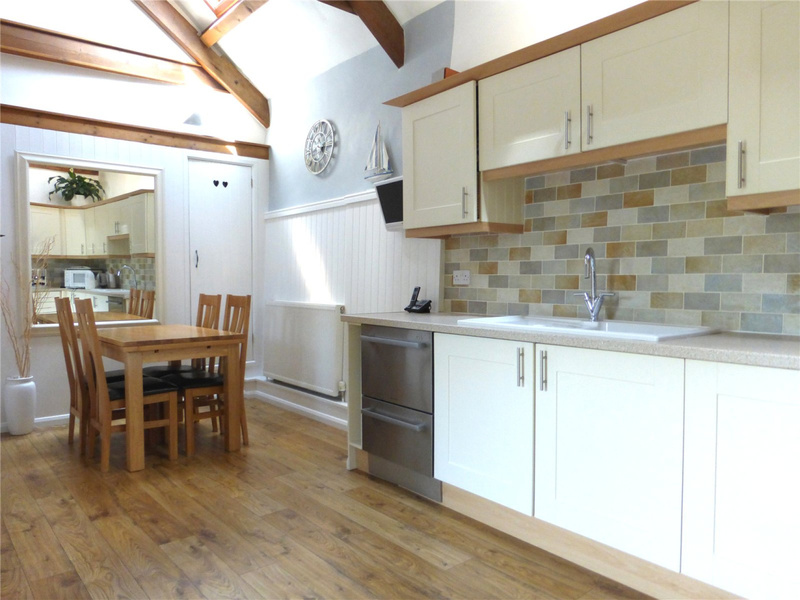 A light airy kitchen with a full height window overlooking the garden and a vaulted ceiling with two Velux skylights. The vaulted ceiling has exposed timber roof trusses and there is a feature stone wall to the gable end. A range of shaker-style fitted units provide ample storage that includes a wine rack and pull-out larder. The ceramic sink has a mixer tap and fully tiled splashback. 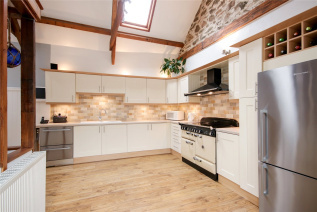 The fitted Elan Rangemaster cooker has a six ring hob, twin ovens and an extractor hood with light above. There is a Fisher Paykel dual drawer dishwasher and matching fridge with automatic ice cube maker and cold water dispenser. An airing cupboard houses the oil fired combi boiler that supplies central heating and hot water. There is also access to a generous, fully boarded loft space that is located above the entrance hall. Television and telephone points are also available in the dining area. A white two piece suite comprising of a WC and hand wash basin with tiled splashback. 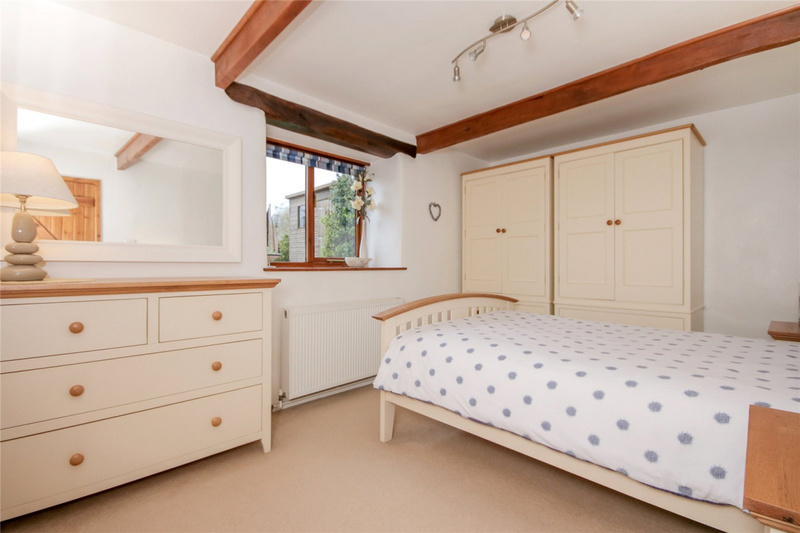 A triple aspect room of great character. 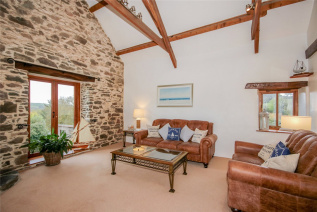 Having high vaulted ceiling with exposed wooden ceiling trusses and an exposed stone wall with French doors that afford superb views across the valley. 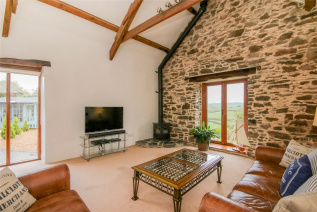 There is a feature stone hearth that houses a solid fuel woodburner. 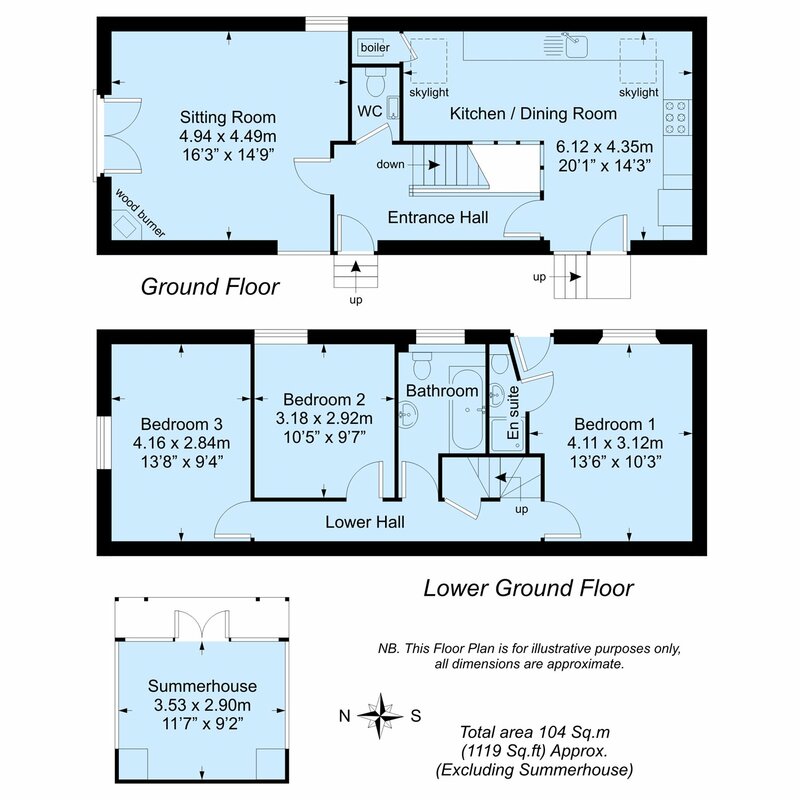 A dual feed, satellite television point is also available in this room. There is an under stairs storage cupboard that houses the electricity meter and domestic distribution unit. 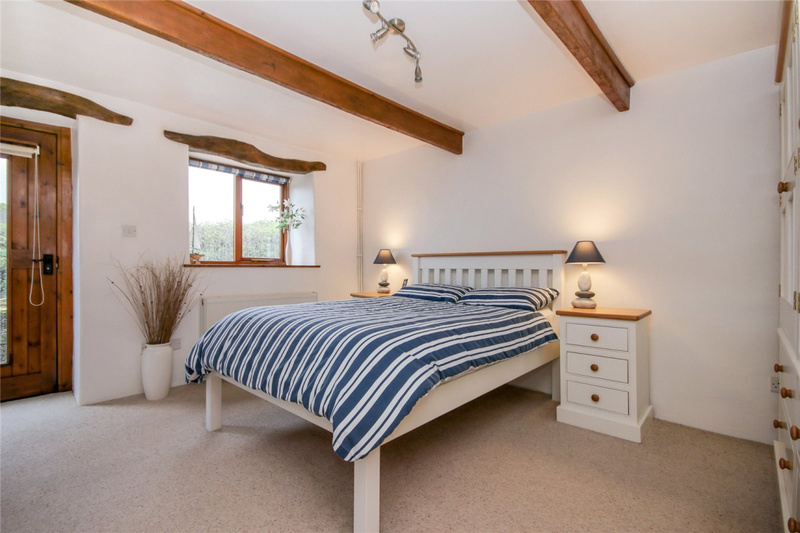 A light and airy double bedroom of exceptional character. Having exposed ceiling timbers, a window to the front with exposed timber lintel and deep pine windowsill. 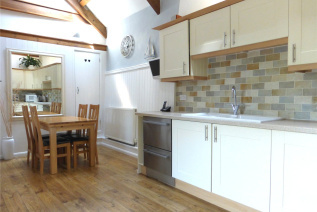 There is a fully tiled en-suite with ceramic tiled floor, WC, hand wash basin, shower cubicle with fitted Mira Sport shower unit and a heated towel rail. A glazed door leads from the bedroom to the front garden courtyard area. Another double bedroom of character with exposed ceiling timbers. 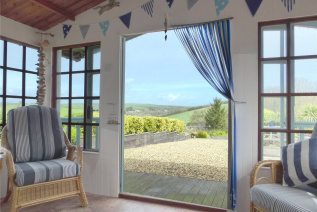 A window with deep pine windowsill and exposed timber lintel above provides a wonderful views over the garden and surrounding countryside. A further double bedroom, currently used as a study, that again has exposed ceiling timbers. A window with deep pine windowsill and exposed timber lintel above overlooks the front, garden patio area. 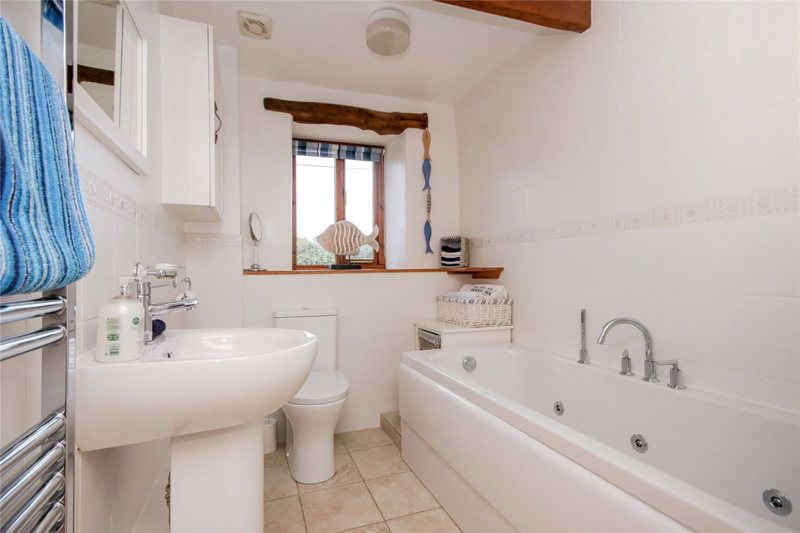 A light airy and beautifully fitted, part tiled bathroom with ceramic tiled floor. The all white bathroom suite consists of a jacuzzi bath with mixer tap, a Mira Sport electric shower over the bath with hinged glass shower screen. A pedestal wash basin with mixer tap and a WC. The bathroom has exposed ceiling timbers, a window to the front with deep pine windowsill and exposed timber lintel above. 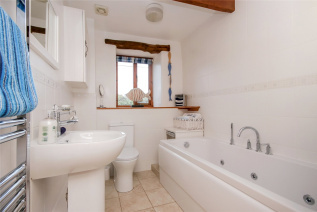 A full height heated towel rail is also located in the bathroom. 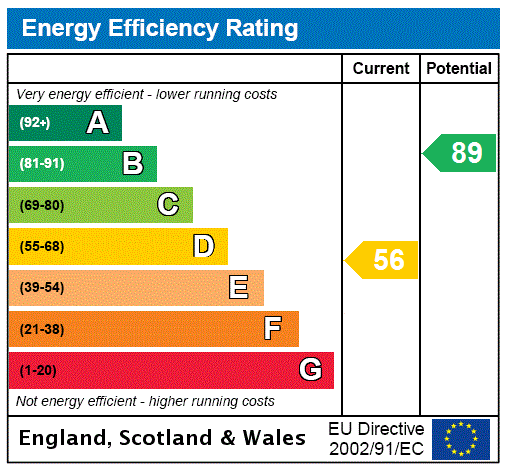 A battery backed, mains smoke detector system is fitted and has sensors on both the upper and lower ground floors. 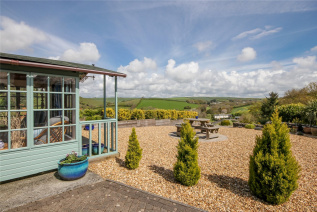 Parking for one car is available in the form of a convenient layby at the front of the property and a five-bar gate and block-paved driveway leads up the side of the property to an extensive parking area. 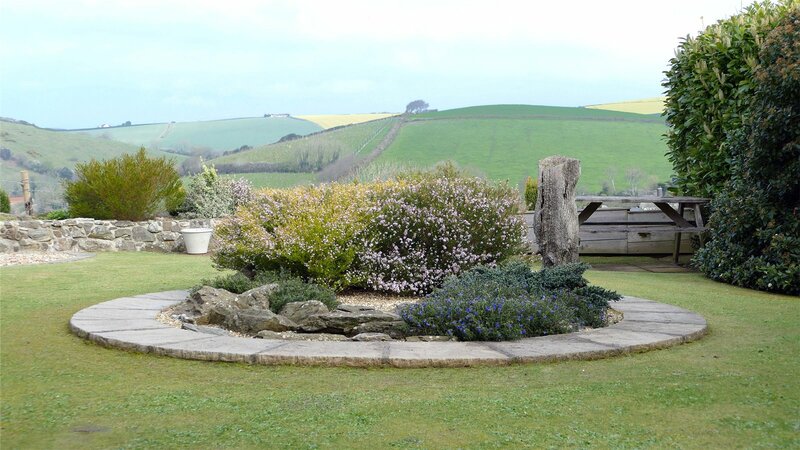 The garden is divided into three main areas all of which enjoy spectacular views of the surrounding countryside. 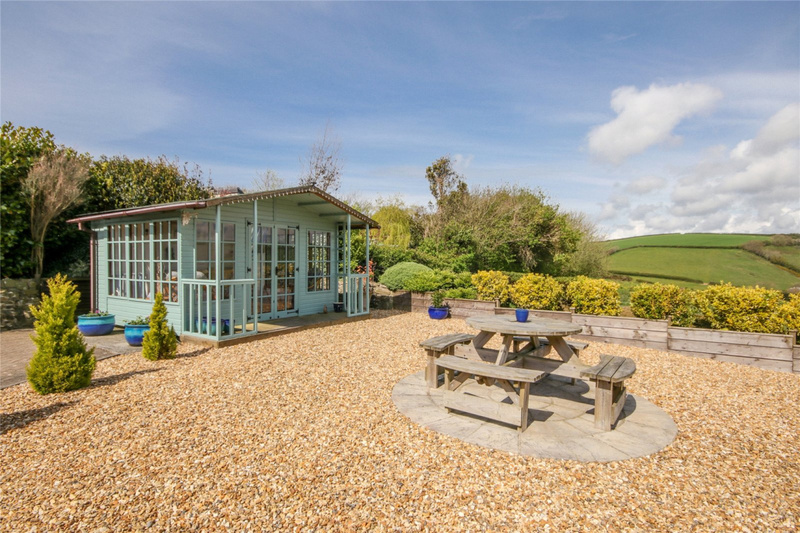 The upper garden comprises a block-paved parking area, large gravelled area with an inset circular paved seating area and a large impressive timber summerhouse. 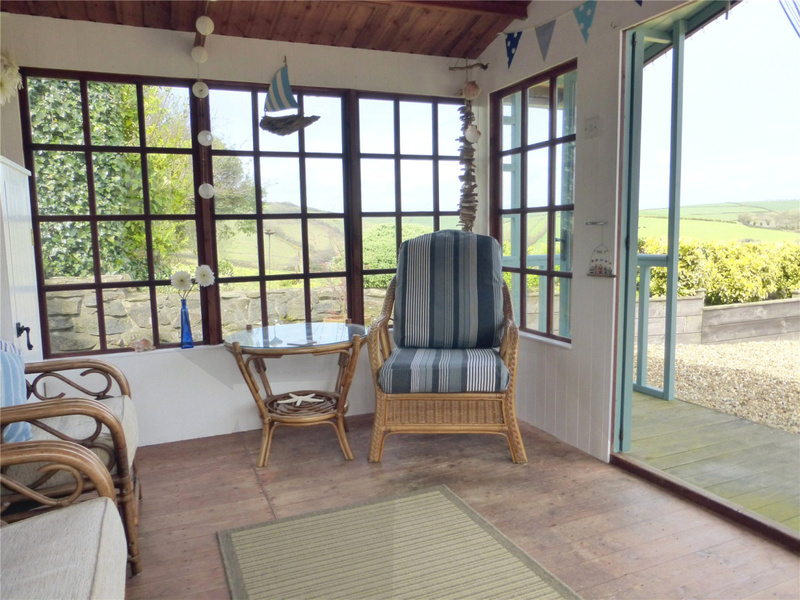 The summerhouse has glazed double doors, windows on three sides, is internally clad, contains fitted cupboards and provides an extensive seating area from which to enjoy the breathtaking view across the valley. Wide stone steps lead to the lower garden. 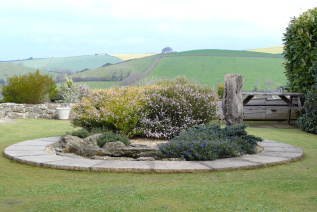 The lower garden is laid to lawn with an inset circular flowerbed, provides additional seating and is bordered by well established shrubs and houses a timber shed. Further steps lead through a pergola and down to the courtyard area. 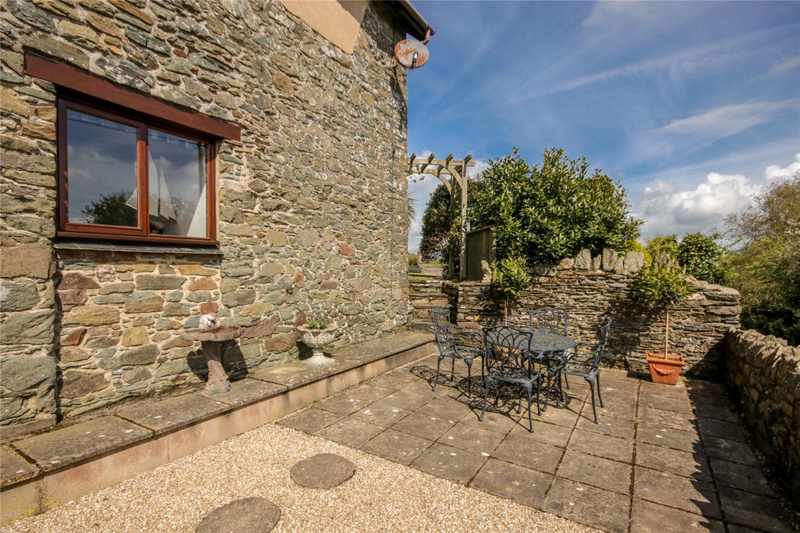 This is a morning suntrap and comprises, paved seating area, gravelled area with inset stepping stones, an outside tap and has direct access to the master bedroom. Mains water and electricity. Private drainage. Oil-fired combi boiler for hot water central heating. From Kingsbridge take the A379 Coastal road towards Dartmouth passing through the villages of West and East Charleton on entering Frogmore take the right-hand turn over the bridge towards South Pool continue on till you reach a left-hand turn signposted Ford. Follow this road into the village, take the sharp right-hand bend and the property will be found further up the hill on the right-hand side.